It’s OK to be Happy! I need to say that. It’s OK to be happy! I mean happy deep down all the way till it bubbles out onto your face and into your life, and effects each day. Do you remember when you were little and you made yourself a fort or maybe you were lucky enough to have a proper playhouse or tee pee! It was simple. Nothing but “sheets” but your imagination ran wild and you played there the WHOLE entire day! That was your only care in the world and you were HAPPY! So much so you passed out right where you were! Flash forward… To your latest and greatest adventure to date! A music festival! Your standing there surrounded by a gazillion people. Your favorite single is being sung live and next to you is your best friend and your newest friend. You’re all swaying, flowers in your hair, singing the words at the top of your lungs! 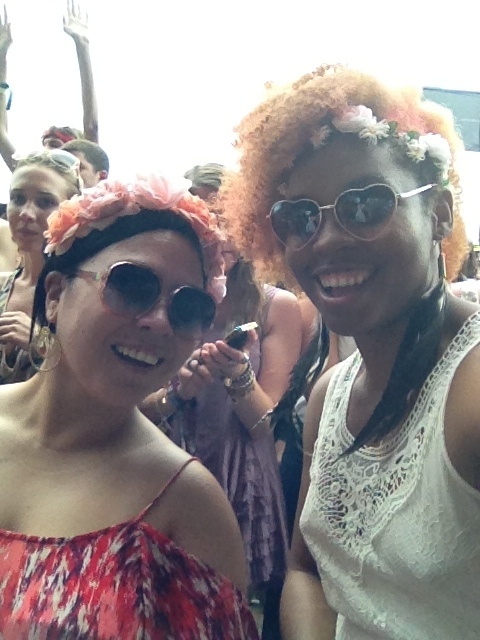 Your hot, sweaty, smelly, braless, flower crowned down, and sporting your best festival apparel. You look around and realize in that moment you are completely happy! Nothing Looming over you! It occurs to you this is living life. It’s not the experience though! Trust me it’s not. It’s the feeling. That feeling of complete euphoria! The feeling you get when you spend the weekend with college friends, sorority sisters, your family. Even by yourself doing the things that you “never” have time for, like reading and finishing a book, making a playlist of songs that perfectly capture your life, or gaming! All of these experiences trigger that feeling of simpler times. Times when we didn’t feel the weight of stability and security; Or the weight of past mistakes and experiences. How do we cope with the new realities and still remain happy and hopeful and willing to see each day as a party and celebration of life? I wish there was an easy answer but there isn’t. It’s helpful though to be honest about what you feel and express it. Try making a list of a few things that threaten your happiness daily. Take your list and make honest resolutions/solutions. It’s going to feel scary but think of it like a roller coaster ride, as it clicks up the steep slope just before the dip! Just before the euphoria! The happy! I recently wrote down the things that threatened my happiness and stifle my laughter. I’m going to start with the first thing on my list and throw myself into creative projects! When I create (or travel) I’m able to connect with my inner self and find that peace that comes with trusting myself. See in these moments that we are do the things that brings us close to euphoria; our hearts and minds are furtherest away from the things that bring us great anxiety. We are fully focused on the the euphoria of the moment. So why not focus on making tough stuff fun, letting go of the stuff that hurts us and fully live in the moment! 3. Then send me an e-mail at UH[at]unbelievablyhuman.com, letting me know how you are Unbelievably Human! Bonus points for creativity!